Paperback, Reprint. SIGNED. An examination of all the known evidence at the time, of all the facts and theories and nonsense that had ever been written about the Ripper. Illus. + Conclusion. 188pp. mass market p/back. Sl. browned pp. o/w Vg. 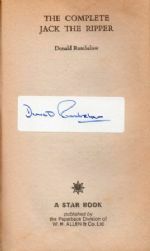 With tipped-in label SIGNED BY DONALD RUMBELOW. 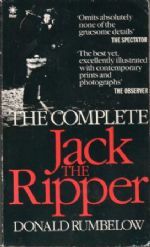 Don Rumbelow was a contributor to the Grey House Books publication 'Who Was Jack the Ripper? A collection of Present-Day Theories and Observations'.